Even though it’s easy to forget, the classic games in the Sonic the Hedgehog series did indeed have a storyline. Of the core five titles from the early 90’s, one single invention from the mind of Dr. Eggman dictated the actions Sonic, “Tails” and Knuckles would be a part of over the course of twenty five levels. I am talking, of course, of the Death Egg. Though clearly a Star Wars reference in both style and name, the giant space station (even if it was only in space for roughly ten minutes) was the centerpiece of the action that went on in Sonic the Hedgehog 2, Sonic the Hedgehog 3, and Sonic & Knuckles. So great was its importance that the station would return in numerous spin-off titles, such as Sonic the Fighters, Sonic Drift 2, and Sonic Battle. Heck, it was even meant to be in Sonic X-treme at one point, although we all know what happened there. So it was head-scratching to think that Archie‘s previous adaptations of Sonic 3 and Sonic & Knuckles completely neglected the use of the Death Egg. Even if the writers hadn’t been able to finish the game themselves, it was mentioned more than once in the instruction manuals for all three games it appeared in. So what did we get instead? Some random ship that wasn’t much bigger than Dr. Robotnik, and a half-baked scheme that turned the bottom of the Floating Island into a death trap. Not exactly the stuff of legends. Even the Fleetway adaptations of those games used the Death Egg, so for us American fans, all we could do was write in and complain to the Archie staff that they had completely forgotten to use one of the most awesome things in the game. 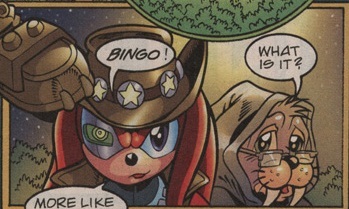 Finally, Archie succumbed to the pressure, and decided to use it, adapting portions of Sonic 2, 3 and Knuckles and introducing the Death Egg into the pages of the comic. And when they did, they did it in a big way. It wasn’t just a random issue of the main series. It wasn’t even a 48-page special that had to share print time with back-up stories about Knuckles the Echidna. It was given the royal treatment. Ladies and gentlemen, I give you SonicQuest: The Death Egg Saga. Being the fifth and final three-issue mini-series Archie would make for their Sonic line, the first issue was printed only two weeks after Issue 41 of the main series, making it painfully clear you were meant to read this right after. Sure, things got a bit awkward as issues 42 and 43 came out before SonicQuest itself was finished, but such is the life of a comic book. I mean, the only thing you could assume was that Sonic wasn’t going to die at the end. Really, who would have even thought that was going to happen? This is a licensed comic, people. You kill off Sonic, you can’t get money. Book One of SonicQuest, written by Mike Gallagher and penciled by Manny Galan, begins where many issues of the Archie comic begin, on the outskirts of Knothole Village, hidden deep within the Great Forest. Even if the first panel is trying to make things mysterious, we find out that one Geoffrey St. John is hiding in the bushes, trying to sneak into Knothole. Though he is confident in his stealth, he is discovered pretty quickly by Sonic the Hedgehog, the reason anyone is reading this comic book. Through some quick dialogue that shows they don’t like each other, their impending brawl is halted by Princess Sally, who states that she was the one who asked Geoffrey to show up in the first place. Glad to know that even if you’re invited by the leader of the Freedom Fighters, you still have to sneak in the back door for fear of getting spotted. Now for those paying attention, you’ve more than likely realized I’ve never mentioned Geoffrey before in these reviews. That’s because, until now, Geoffrey hasn’t played any part whatsoever in what this series of reviews cover. However, he was certainly not an unknown character if you read the comic month to month. Introduced in Issue 20 within the Princess Sally Mini-Series prelude, Geoffrey St. John was an original character created by Ken_Penders to try and make things in the comic interesting. Once leader of the Royal Guard before the coup done by Robotnik, Geoffrey was shown to be slumming it with his own band of Freedom Fighters, who help Sally do absolutely nothing in her mini-series. After that, he was poised to be her alternate love interest, always butting heads with Sonic trying to woo the Princess’ heart. Guess Antoine wasn’t enough for Ken. Either way, it is kinda creepy to think about how much older Geoffrey has to be. If he was King Acorn’s guard, that means he knew Sally when she was just a little girl, which means…let’s move on. 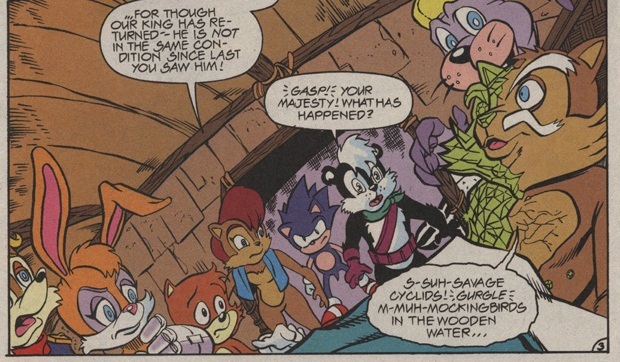 With the skunk still trying to prove his worth to Sonic by mentioning his history in a single sentence, Sally tells him that his services might be needed once more, stepping into the nearest hut to show the rest of the main cast standing around the half-crystallized form of King Maximilian Acorn. If this is your first Archie comic, don’t worry. Sally goes into full exposition mode in the next page, telling everything that’s been going on for the last five issues, even if they have nothing to do with the King. Recapping the Mecha Madness Saga in which Sonic was roboticized by Dr. Robotnik ever so briefly and then court marshaled for no real reason, Sally compares the destruction Mecha Sonic caused to the current state of Robotropolis from the earthquake that had struck the issue prior. Only then does she casually mention how they saved her father from the Zone of Silence. You’d think maybe she’d be a bit more excited to tell Geoffrey that her father is still alive, but hey, he’s not roboticized or anything. Crystal definitely isn’t as cool to kids. Telling St. John that they have yet to inform the general populace of the king’s return, Sally asks if he would take up the post he once held, which he accepts without hesitation. 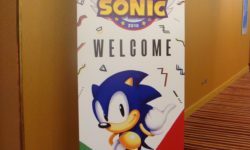 Thankfully, the skunk walks right out of the story, though Sonic can’t help but slide in one more snide remark. With that out of the way, we are no closer to any action, the talking heads beginning once more. With the core Freedom Fighters standing about wondering just what the heck to do with a half-crystallized, babbling king, “Tails” makes the most obvious remark ever. “The King looks like he’s turning into a Chaos Emerald!” Helpfully reminding the reader that these show up in zones (which the editor reconfirms as being from the games, desperately trying to reassure us this has something to do with the source material), it shocks everyone in the room. Sally questions aloud why they didn’t see any emeralds or rings in the Zone of Silence, though I don’t see why that would be something unusual. It’s not like on the world of Mobius they’re hanging out everywhere. And it’s also not like they looked around the entire Zone of Silence, either. I think the writers are trying to hint at something here, though to be quite honest I don’t get what that’s meant to be, since talk of Chaos Emeralds inspires Sonic to rush out and come back with…a ring. The last page of part one has Sally screaming about Robotnik, and low and behold we get to see him right off in part two, talking to his nephew/sidekick Snively. Because Sally had all the bases covered, Robotnik only needs to let us know that, yes, they’ve been rebuilding Robotropolis. He turns over supervision to Snively, not because he trusts the pint-sized punching bag, but because Robotnik has bigger plans in store – seems something he’s been working on is almost ready to go, and he sets off to be there when it launches. Wonder what it is? Well you shouldn’t, since this is called the Death Egg Saga. The dictator doesn’t stick around for long, jumping into his Eggmobile and flying off to parts known. 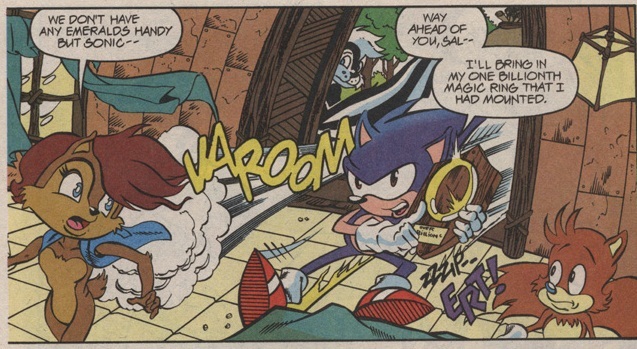 Without the shadow of his terrifying uncle, Snively immediately perks up since he’s now in charge, demanding all restoration to halt so that the SWATbots can wait on him hand and foot, and to change the name of the place to Snivopolis. This is where they’ve lost me. I know Snively is supposed to be afraid of his uncle while at the same time plotting to somehow overthrow him. But why is acting so presumptuous? Robotnik isn’t leaving for good, Sniv. He’s coming back regardless if he wins or not, and he’s going to notice you being a lazy sod. And…why would an entire city need to shut down for you? You don’t need ten thousand SWATbots doing whatever the heck it is you want them to do. Even the SWATs seem confused by this plan, because this also apparently prevents them from going on routine patrol around the city. No wonder they never made a third season of the Saturday morning series. We jump back to Sonic and “Tails,” who are running to the aforementioned grotto, letting us know they have no idea what to expect. Sure, they used to have surveillance cameras aimed at it, but after all the insanity that’s been going on in Robotropolis, they haven’t bothered to replace the now-damaged camera. That’s why they’re allowed to be shocked when the duo discover the hole has been covered in a “dome of impenetrable steel!” They don’t test it, of course. I would think Sonic would take a whack at it just for the heck of it, but hey, who needs anyone in character? Instead, we get Sonic talking about how he’ll run off and ask Carl Condor if he knows anything. Wait, you don’t know who Carl Condor is? That’s ok, because he’s never been mentioned before. Or since. In fact, there really isn’t any good reason for this band of Airborne Freedom Fighters to exist, as it implies that they are somehow closer to Robotropolis than the Knothole group. Meanwhile, back in the Death Egg, Robotnik is triumphing the successful beginning of “Operation: Operational” (how creative), though he can’t help but destroy the SWATbot who was in charge of the ring excavation. Because of the amount of added debris that was vacuumed up, time will needed to be spent separating the rings from the extra mass, the irony being that if Robotnik was paying attention, he’d realize that he had also sucked up one of the main Freedom Fighters. Oh well. Throwing the robot down the garbage shoot, the evil dictator takes his seat. 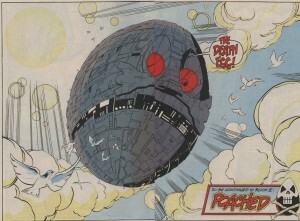 With fuzzy dice above his head, the reader is soon treated to a full two-page spread of the Death Egg. Oh. There are doves flying around it. Why is that. Also…the Death Egg isn’t Egg shaped. It’s spherical. Sure, you can’t really tell in Sonic 2, but Sonic 3 & Knuckles makes it pretty clear. Then again, I’m assuming the artist cared to look up the source material before drawing. You had enough time to go through the game by this point, Archie. 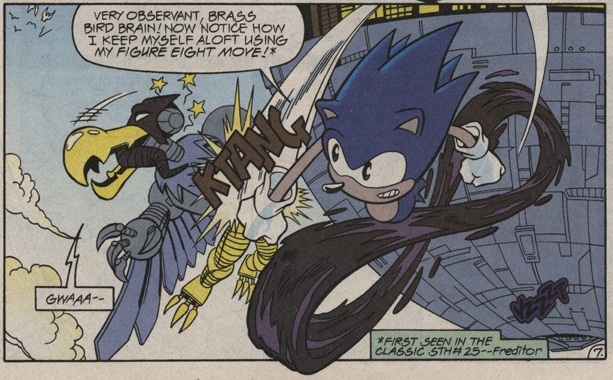 I know it’s super tempting to make it that way because of the title (heck, Archie still is shaping it that way to this day, not to mention Fleetway’s take on it), but Sonic Team was able to resist the urge to really strike the pun home. With that, the first issue of the mini-series ends, leaving the original readers to wait a month before they could find out what was to happen next to their favorite heroes (as I’m assuming no one was wondering what Geoff was going to do next). The second issue, entitled “Poached,” begins with yet another recap, though thankfully it doesn’t take too long before we jump right back to where we left off in the last issue. Snively, being massaged by a robot (wait, is that even going to feel good?) is interrupted by the staticy image of Dr. Robotnik, calling the Snivmiester from the deck of the Death Egg. With the craft now airborne, the mad dictator explains his plans in a bit more detail, explaining the purpose of the oval shaped fortress – to roboticize the entire planet in one fell swoop. He also goes on to mention that the massive amount of rings that were sucked up are being placed in a chain-mail pattern right inside the outer hull of the ship, in order to make the Death Egg invulnerable to outside attack. That’s…almost kinda clever! Before he can continue to gloat, Robotnik declares that only one more item is needed before the vessel can become fully operational. What could that be? A Chaos Emerald, what else? Though I don’t know why Robotnik would launch the ship in the first place if he didn’t have its main power source. You would think that maybe getting a Chaos Emerald would be the first priority, because what if he can’t get once once the Death Egg is flying overhead? You’re not going to get very far if you’re crashing into the ground right afterward. …ok. I should probably mention this. Back when the issue was originally published, a handful of pages were printed oddly. Through some error, the coloring process was switched up, giving those pages a weird blue/purple tint. 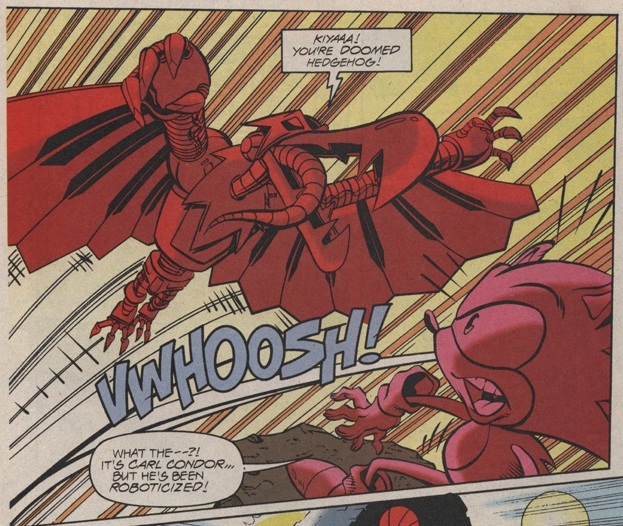 The two main pages of this fight suffer from that problem, as did the very first page of the comic. Don’t worry kids, it doesn’t take up the majority of the comic…though it will show up again before we’re through. I’m not sure if they ever bothered to reprint the second issue to fix the color issues, but hey. I’m sure someone was excited to see their fancharacter make an unexpected appearance underneath a purple sky. Back to the story, Sonic once again shows off that figure-eight move (boy, the folks at Archie sure were obsessed with that), using it to somehow stay afloat in the air. Yeah. Don’t know how that works either. Even though Sonic doesn’t immediately fall to his death, Carl trumpets his superiority in the skies, which Sonic can’t argue with, desperately looking for some way to get the upper hand. Lo and behold, the released derbies from only a couple pages before show up, the roboticized Condor getting caught up in the confusion. He soon joins the same fate as unnamed SWATbot, Sonic taking the opportunity to jump up the falling tree logs to reach the open hull, utilizing the skills he’s learned from all the years he’s spent jumping in zones. Sure, I’ll buy that. Whatever. Either way, Carl falls to his death (because even Ian Flynn doesn’t want anything to do with the character) and Sonic finds himself unable to get back in contact with Knothole. With his brown eyes looking out beyond the closing bay doors, Sonic realizes that he’s on his own…not sure why that’s such a bother, since he seems to enjoy fighting Robotnik on his own most of the time. Maybe it’s to make us feel the gravity of the situation! We still have an issue and a half to get through, and this review has already been going on for far too long…which can only mean one thing. That’s right, we’re going to leave things on a cliffhanger. What is to become of Sonic now that he has finally entered the Death Egg? What will “Tails” do now that he is in the belly of the beast? Will Princess Sally end up doing anything useful? Get the answers to these questions and more as we continue our journey through the first Death Egg Saga, with part two of this review coming up tomorrow. What, you thought I was going to make you wait another eight months? 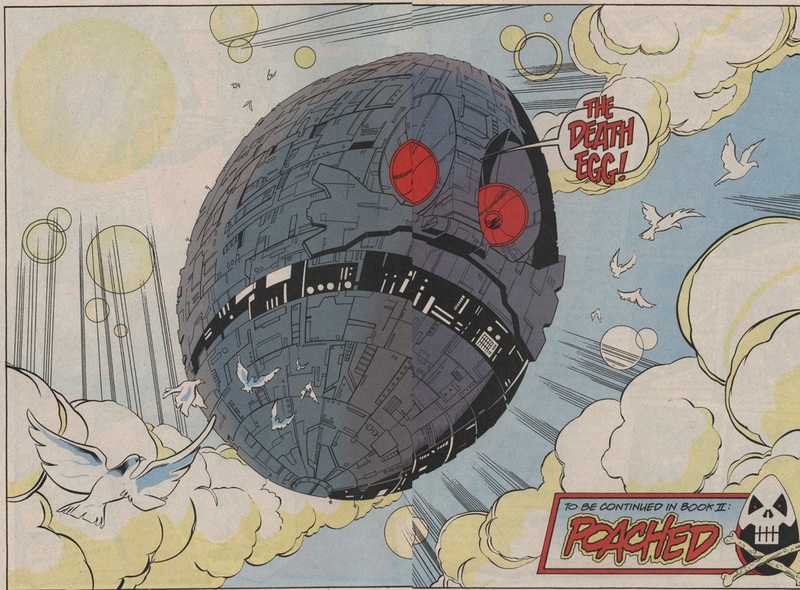 Archie did use the Death Egg in Sonic Quest as you just stated, but the Death Egg was used again (But this time as “The Mark II”) in the most recent Archie issues. 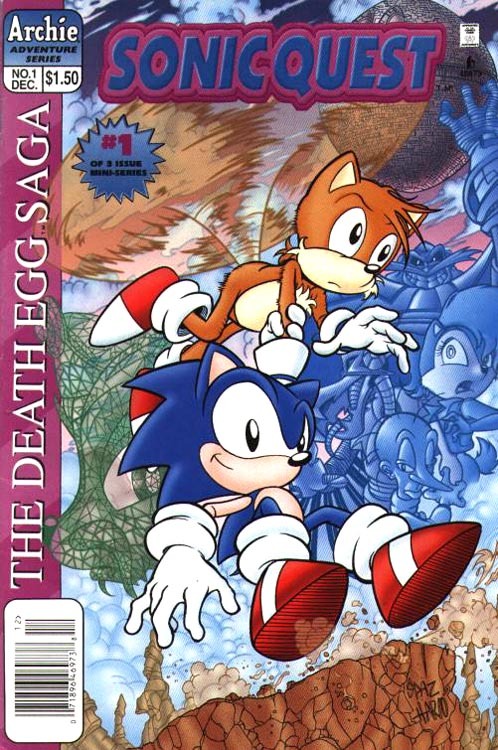 In the past 6 comics, Eggman used the new Death Egg to blast Sonic and his friends to the Genesis Universe and when they all got back, Sally sacrificed herself to save everyone and was turned into a robot. Fleetway handled the Death Egg storyline MUCH better than Archie, just like they did with nearly everything. Oh, and also, Archie’s early “adaptations” of early Sonic games weren’t really adaptations, despite calling them that. They were original, short (and lazily written) storylines that were totally different from the original games’ stories, and the only connection was having the same characters (and, some times, the same settings). Take for example their Sonic CD “adaptation”: there was no Little Planet (the central element of the game’s plot) or Time Stones. 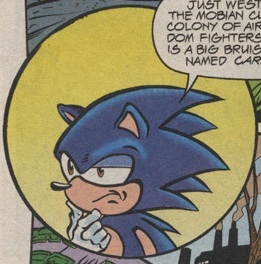 Instead, the whole story took place in Stardust Speedway, which was NOT located in LP, and Robotnik’s whole scheme was to have Metal Sonic (mistakenly called “Mecha” Sonic, the name of a whole different Sonic character… how lazy can you get, Archie?) defeat Sonic. That’s it. Not capturing Little Planet, time traveling to the past and taking it over Little Planet, or collecting the Time Stones. How lazy must you be to get wrong the adaptation of a story as simplistic as Sonic CD? And let’s not even get started on their so-called adaptations of Sonic 3 and S&K. Bottom line is, Archie is filled with a bunch of hacks who couldn’t write decent Sonic comics if their life depended on it. Good stuff, David! Looking forward to the next part. Mixing Metal Sonic with Mecha Sonic is lazy? Sorry, but you don’t know what you’re talking about. Back in the 90’s, people in the western Sonic fandom mixed up Metal Sonic and Mecha all the time. There was little “official” distinction between the characters. 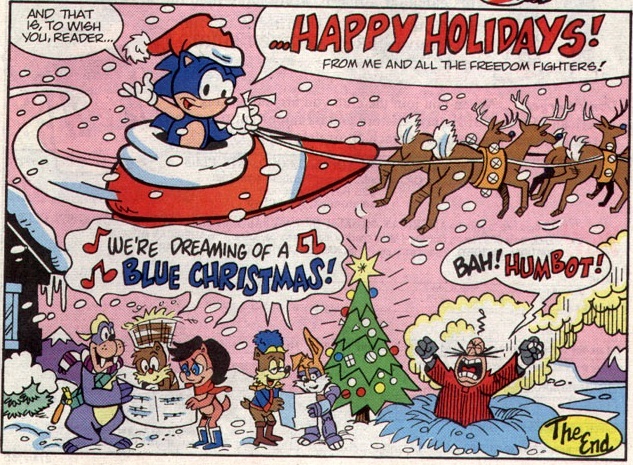 Fleetway could have easily made the same mistake. I hate Archie’s adaptations of the video game stories with a passion. The plots often had NOTHING to do with the stories they were based on, and felt like the most lazy and uninspired stories in an already pretty lazy and uninspired comic book. So much wasted potential, as I love the games’ universe and characters. But I suppose that’s what happens when you ask untalented people to produce a comic book adaptation of your premiere video game series. What team? If you mean Archie then yea they got Megaman and has been doing really well with it, if you meant the people who wrote this mini-series then they are long gone as this made in the mid 90s…. Wait a minute, he had the ring mounted? Wouldn’t it be easier to keep it, you know, in a safe or something lest bad guys get into Knothole (and that’s happened before)?